This image of the Dogleg Galaxy (NGC1097) is spectacular both for what it shows and for what it hides. The low exposure reveals the brightest structure in the central region of the galaxy, especially the "Ring of Pearls" around the nucleus. This ring is conventionally explained as knots of star formation triggered by gravitational disruption. But plasma cosmologists will notice the rough pairing of "pearls" and recall the pairing of Birkeland currents around plasma toroids in laboratory experiments with the plasma gun. A view down the barrel of the gun shows a ring of pairs of bright dots. Gravity-induced collapse of gas clouds into stars has few other consequences. But the paired Birkeland currents in a plasma gun feed electrical energy into the plasmoid. When the energy reaches a critical level, the plasmoid discharges its energy into an axial jet and ejects knots of highly-charged matter. So is the Dogleg Galaxy simply an island of gravity in empty space, or are there "further consequences"? What's not shown in this image is the pair of faint jets and counter-jets that stretch away to nearly twice the diameter of the galaxy. The longest jet ends in a right-angle bend, which gives the galaxy its name of "Dogleg." Halton Arp has called them "the most extensive, low surface brightness optical jets of any galaxy known." But to image them requires long exposure times. The discovery of "further consequences" requires more patience and daring than convention allows. What else is not shown in this image is the bright x-ray quasar just beyond the dogleg jet. On the opposite side of the galaxy, along the dogleg's counter-jet, is a line of quasars that terminate on a BL Lac object (a rare kind of variable quasar). This object is brighter in x-ray light than the galaxy, indicating an electrical discharge even more intense than the central plasma gun's "Ring of Pearls." Readers who are familiar with Arp's work will recognize the common occurrence of quasars paired across an active galactic nucleus. The second jet emerges from the galaxy just behind the dislocation in the upper arm. Significantly, there is also a gap in the lower arm at the position of the counter-jet. It appears that the plasma gun in the nucleus fired its last shot through the arms. Judging by the distance the arms have rotated beyond the jet, the shot was fired about ten million years ago. In addition to the jets and the quasars sprinkled along and between them, lobes of hot material are pulled out in the same direction. 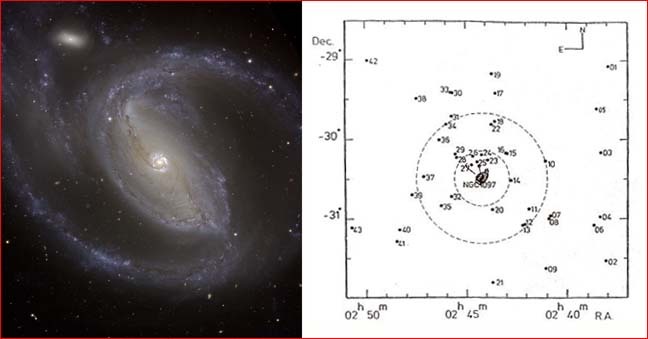 The Electric Universe interprets these observations as the consequences of an electrical surge in the circuit feeding the Fornax cluster of galaxies (of which NGC1097 is a member). Usually an active galactic nucleus will eject its jets and quasars along the galaxy's spin axis. But occasionally, as in this instance, the plasma gun mechanism in the galaxy's core will "wobble," becoming a "loose cannon" that ejects in the equatorial plane, disrupting the spiral arms.